Did not like this one much at all. To be fair, Mortal Engines, which I had dubbed the “London-on-wheels” movie, looks tremendous. The visuals and the CGI of this film is top notch. That is where the positives end. 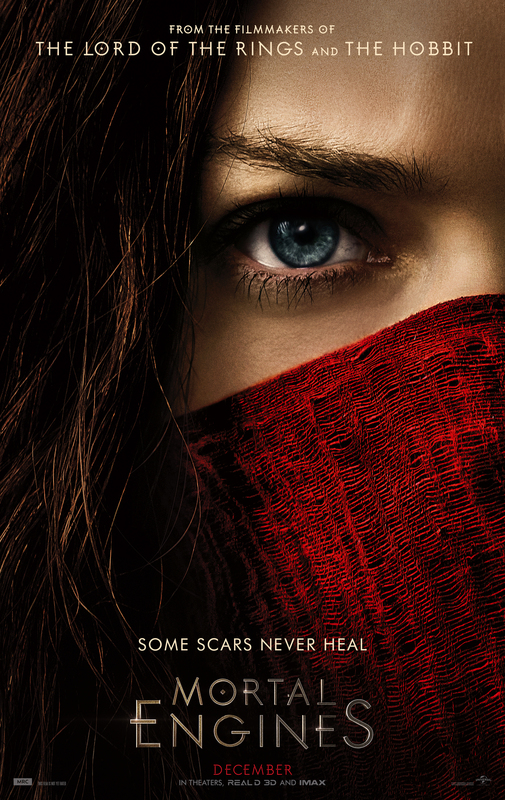 Mortal Engines is the story that sees cities on wheels rolling around the countryside “consuming” other smaller towns and a group of heroes look to help stop a conspiracy led by the one note villain Thaddeus Valentine (Hugo Weaving). Our main heroine is Hester Shaw (Hera Hilmar) whose mother was killed by Valentine when Hester was a young girl. She tries to gain revenge on Valentine but fails and she then escapes with Tom Natsworthy (Robert Sheehan). I was unbelievably bored through most of this movie. The beginning 10 minutes or so had some promise, but the remaining time of the film was just so dull and lifeless that there was not reason for it. I had zero care about any of the characters so I anything that might have happened to them did not effect me in even a little bit. Oh, and, despite what the trailers may want you to believe, Peter Jackson is only one of several writers and one of several producers on the project. The promo material makes it sound as if it was straight from the mind of Peter Jackson and that is stretching the truth considerably. Mortal Engines was boring and I did not like much about it. It did look great though. I have nothing more to say.